Guess what, you guys!!?!?! Last week I was the lucky winner of a set of fun Elmer’s Painters Markers! These markers can paint metal, canvas, clothing, paper, and pretty much anything else. 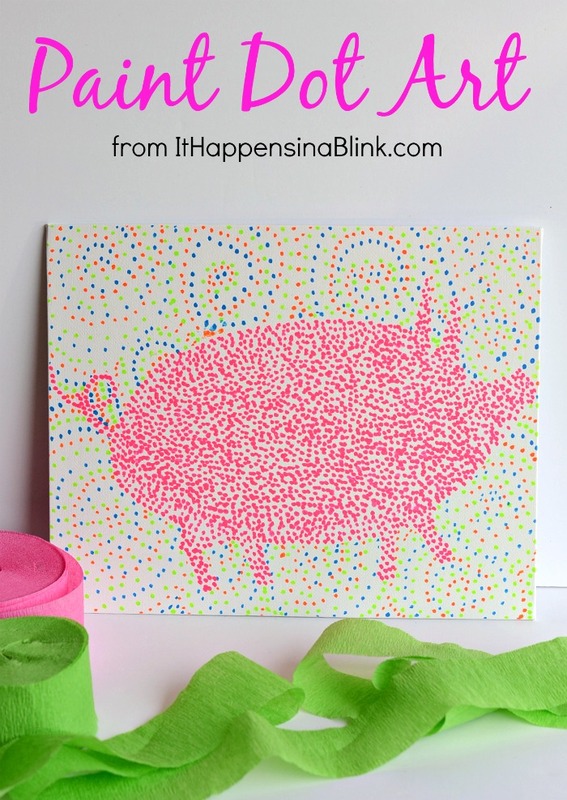 I squeezed in thirty minutes one day while waiting on dinner to cook to create a fun Piggy Paint Dot Art Canvas. As quick as they are to make, I think that these would be perfect for a fun party decoration. Change up the animal– the technique is still the same. 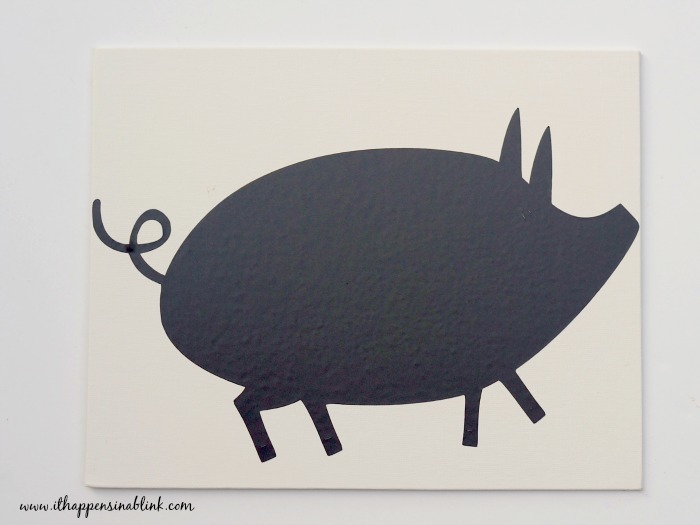 I used my Cricut From My Kitchen Cartridge to cut out a 6″ pig shape out of vinyl. I applied the vinyl shape to the canvas. 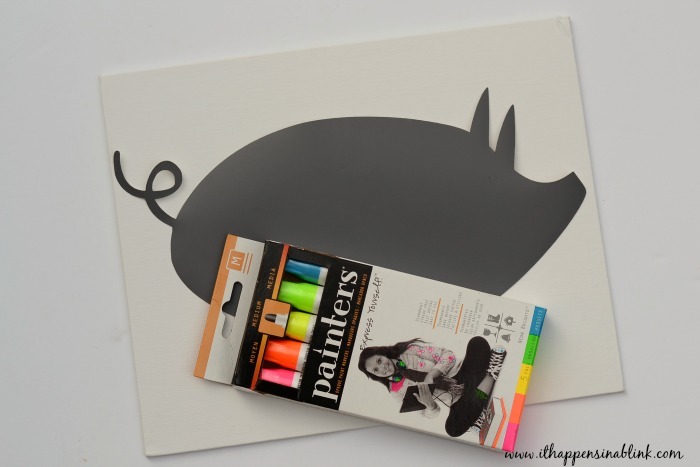 Pick one color paint marker and create swirls on the canvas around the pig shape. 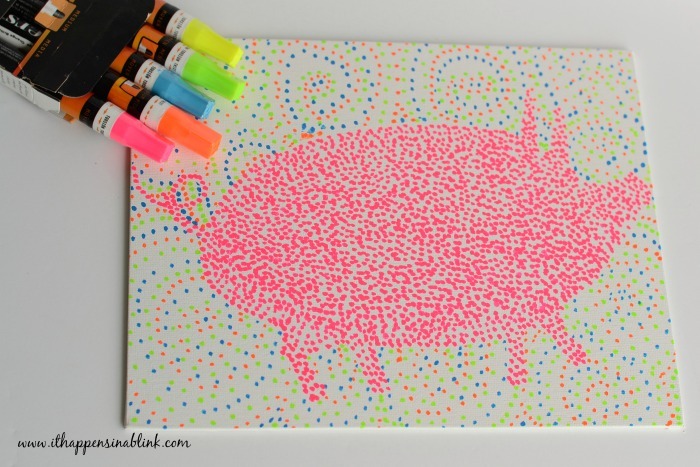 Just use the paint marker to create dots! Fill in with the remainder colors. I saved the pink for the pig. Let the swirls dry and then remove the pig vinyl shape. 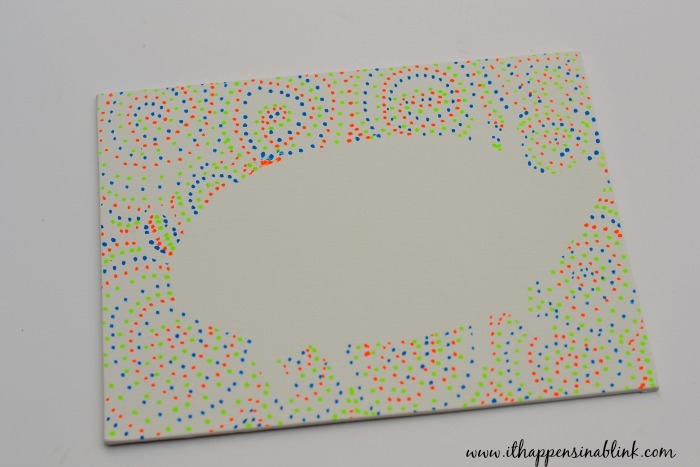 With the pink, make dots around the pig shape until the little piggy is no longer blank. Simple, right? You know I’m all for projects that I can complete while dinner cooks. And these paint markers are a great way to paint without making a mess. I love the painting. What a fun project! Way cool! This is perfect for a gift. How fun! I vaguely remember doing something like this back in art class in elementary school! I got a bunch of little canvases when my girls were babies thinking I would do some really cool jungle scenes. Needless to say I still have them and don’t know what to do with them. This is a great idea that I can do WITH my girls instead of just for them :). What a fun project. I like the vibrant colors of the marker. This would look cute in my kitchen! What a cute idea! This is something kids and adults can do and be successful! Oh my goodness this turned out great! 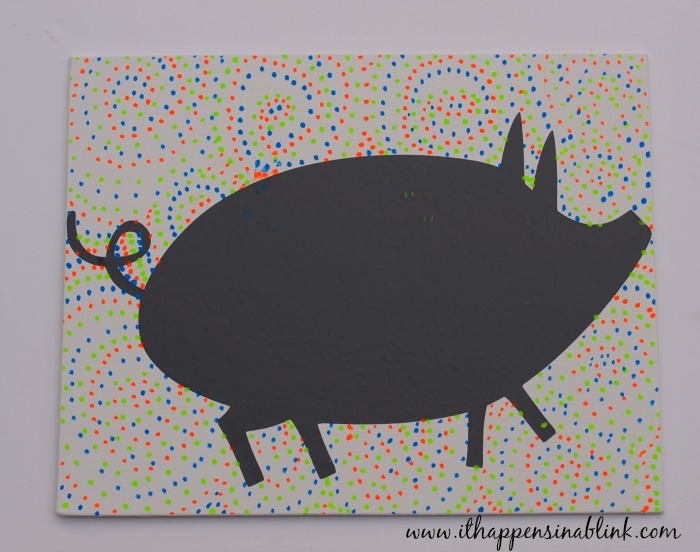 Love the colors you used and a great trick with the pig. My daugher would like this craft. Wow I love how this came out! I would probably have spend a fortune on a piece of artwork like this! 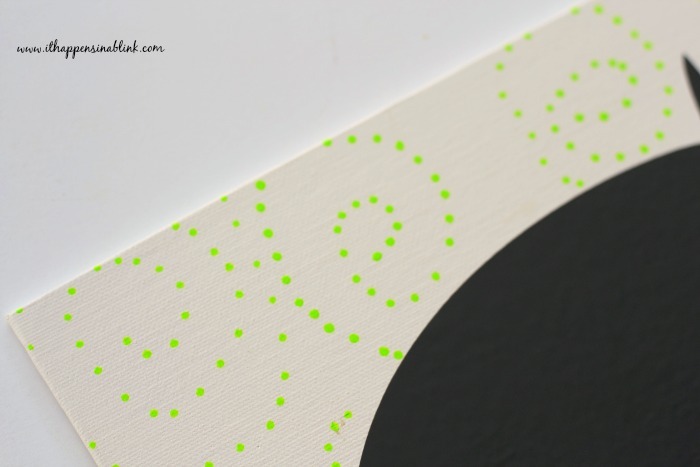 Dot art seems cool and different…im liking it! Wow!! That is very colorful markers. My kids will enjoy this for their art project. How fun! That’s a really fun idea … I’d love to do it with my kids. I’m pinning! Now that’s smart, I would love to do this with my daughter; I know she’ll love it. Frame it! What a fun and simple artsy project!! I have not seen anything around like these. I think they’re really cool! That is so neat and so super cute. Will have to do it with my daughter. That would be so much fun to make that. You came up with a great idea! This is really cute. Looks like something my kiddo and I would love doping together. She loves stuff like this that is intricate and detailed. After reading the title, I was like Paint Dot Art?? Really? Fun idea! My kids would love this! That is so precious! I want to make this for my daughters bedroom . This looks so cute! You did a fantastic job on it.